If you have a Facebook account, a Gmail account or any online service which involves multiple logins, then you might be well served by a password manager like Password Memory. This password manager supports 3 different encryption algorithms to ensure high security and storing data behind on master password. Using the interface of Password Memory is easy and looks great. To add new passwords, just use the side panel; you can also copy to and from the clipboard. Version 7.0.1 is a freeware program which does not have restrictions and it's free so it doesn't cost anything. 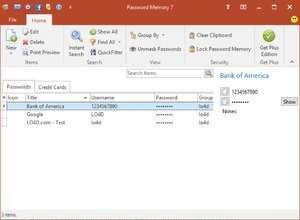 For security reasons, you should also check out the Password Memory download at LO4D.com which includes virus and malware tests. Additional screenshots of this application download may be available, too. Password Memory has a presence on social networks.